Click on pink-bordered photos for full-size, full-resolution photos. Paris, France: We left under the cover of night at 1am, on a tour bus. I didn't want to drive all the way to Paris by myself, and bringing co-workers just greatly increased the chance that my plans would be highjacked once more. Our first stop was at a gas station an hour outside of Paris. It was to be a breakfast stop, and I wanted to get in some food early so I could use all my sightseeing time for sightseeing. There wasn’t much selection and I ate a cold salmon/cream cheese sandwich. Yuck…I can still taste it. 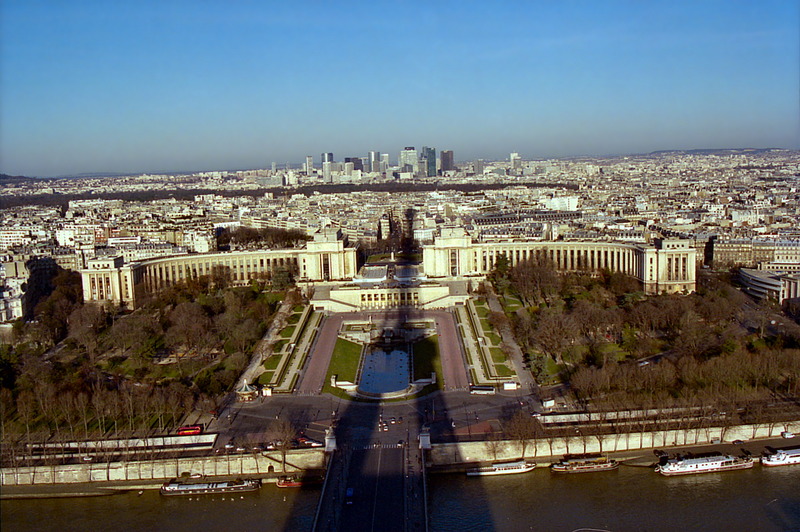 The sun rose as we entered Paris (Arc de Triomphe Carrousel at the Louvre with the sun shining off the Arc de Triomphe in background in above photo). 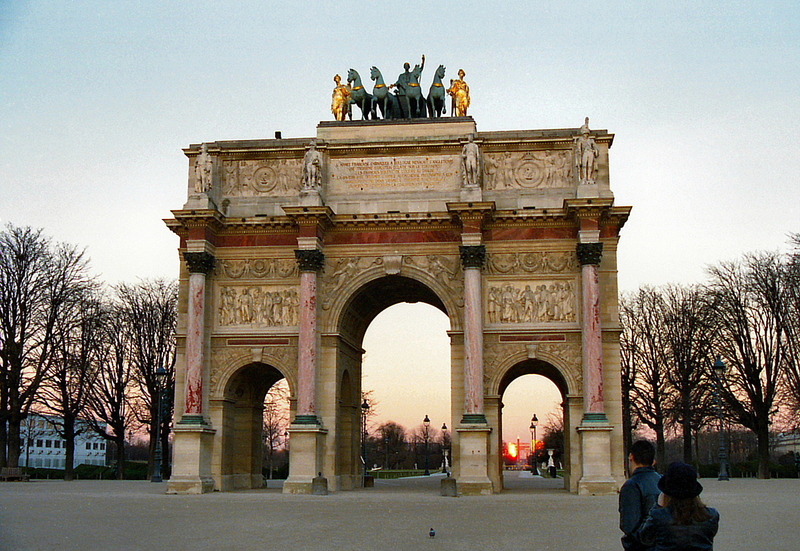 The Arc de Triomphe Carrousel was directly in line with the great Arc de Triomphe on the Champs Elysees. The lady who was in charge of the tour passed out tourist maps and shopping coupons and guess whose picture was on both of them? It was my friend Laetitia Casta! She was quite a sight so early in the morning…so lovely… ahhh. I showed the picture to the guy next to me but I don’t think he believed me when I told him she was my friend. I wasn't so sure of it myself. I hadn’t heard from her in almost a month. She’s a busy woman and we hadn’t been speaking much since an argument we had in September 2000 regarding conflicting moral/political positions. This was the fourth time I’d visited her country. We kidnapped a French tour guide and drove around the city for 30 minutes, and it was quite humorous, the things we were told. She wasn't so nice to the French, even though she was French. We were able to see nearly all points of interest on that tour, and I remember riding past the Notre Dame Catheral with the sun coming up--spooky. I didn’t have a window seat so I couldn’t shoot any photos. 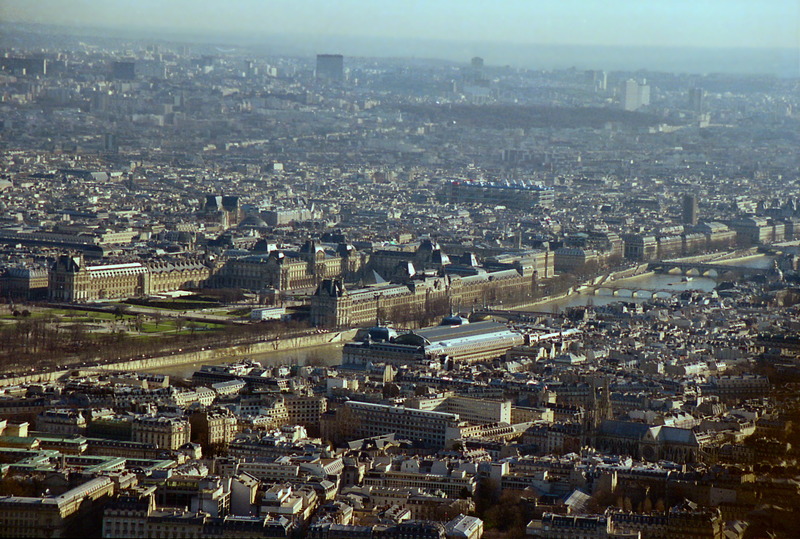 We disembarked across the River Seine from the Eiffel Tower at the Palais de Chaillot. The tour guide showed us how to use the subways...I already knew, so I felt smart. I bought a day-pass for it which I never used. I ran across the Pont D’iem bridge to the Eiffel Tower and took a few photos although it was not a good time because the sun was directly behind it. 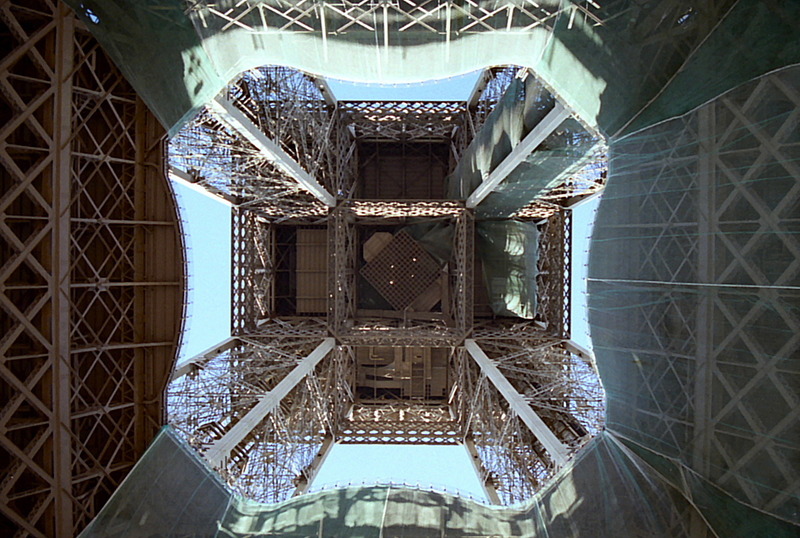 Then I once again ran up underneath it to get a photo (to the right) between the legs. I felt like a doctor delivering a little baby television antenna. I bought a ticket and went to the top. They searched my backpack to ensure I wasn’t carrying a handheld thermonuclear device. Satisfied I’d left it on the tour bus, they let me ascend the tower. 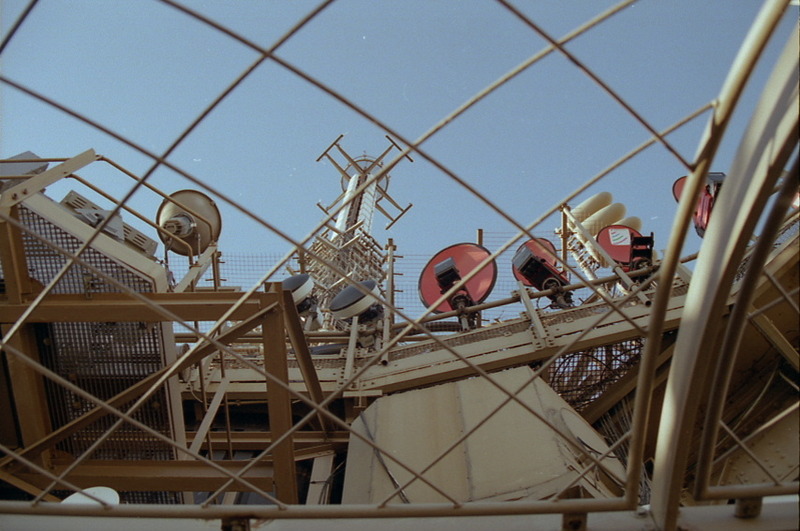 It's a shame they didn't have one of those "No Jokes" signs like they have at airline security, because I had a few good French jokes I needed to leave at the bottom of the tower. 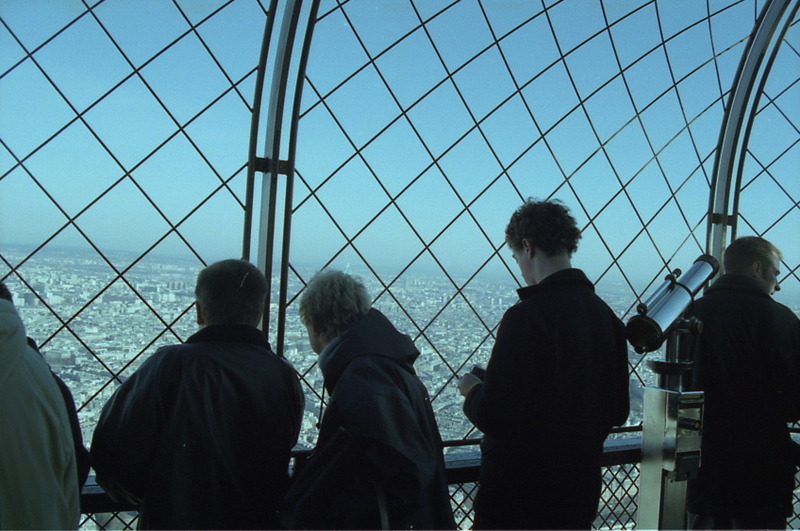 They were more dangerous at the top--farther to fall. 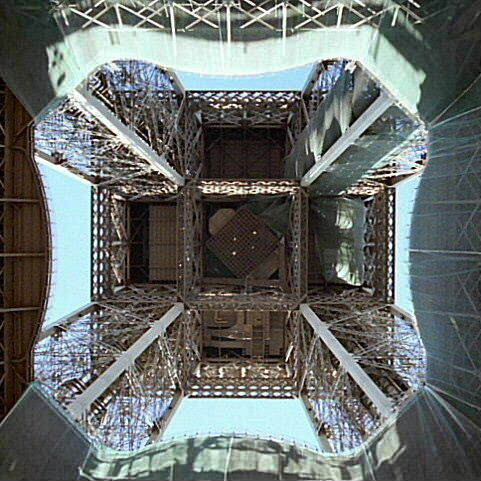 The Eiffel Tower is not composed of huge girders but of smaller plates of steel riveted into a complex mesh of steel. 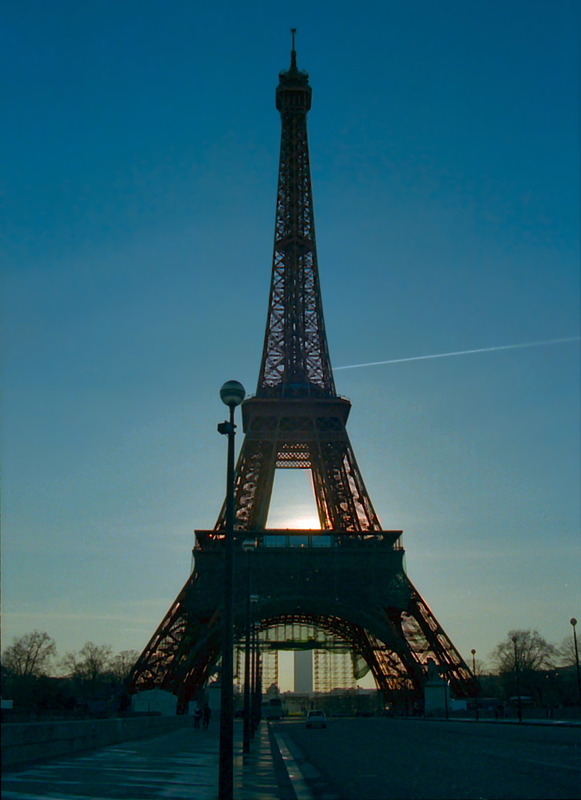 It’s built of wrought iron rather than lighter steel so that the excess weight of the structure helps stabilize it and there is less sway. The base is bolted to the foundation but it is heavy enough and wide enough at its base that it would easily stand on its own without being attached to the base. Note Eiffel Tower shadow as I look down on the Pont D’iem bridge, again towards the Palais de Chaillot, and just to the right of the bridge, the tour bus I came in on--click to get full size photo. 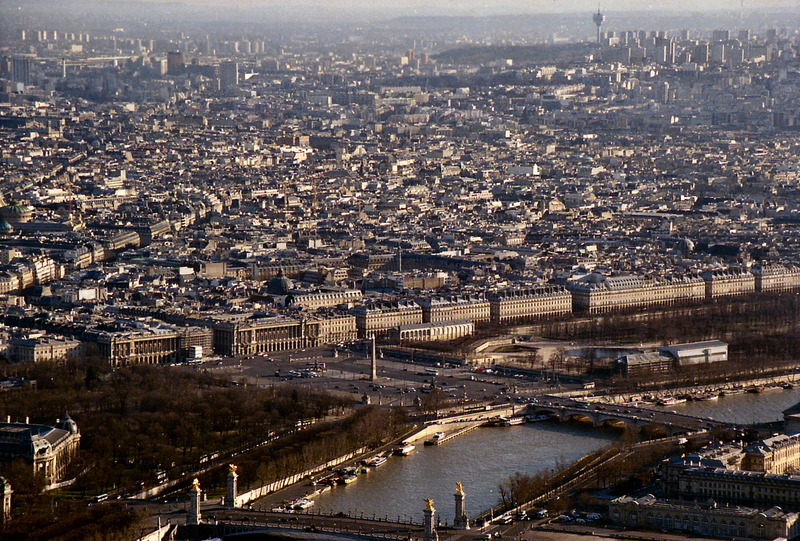 I discovered two interesting things about Paris. Firstly, it looks better from the air than it does on the ground. 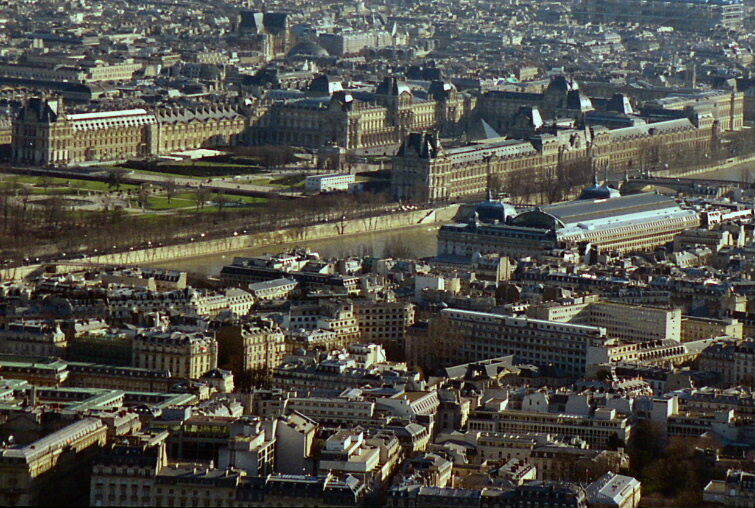 The tightly clustered white buildings glow from the sun when seen from above. It’s one of the most beautiful cities I’ve ever seen. And lastly, like Elizabeth Taylor, Paris looks better in the dark. I guess the lights shining through the night sky make it mysterious and exciting. It’s still gorgeous by day. 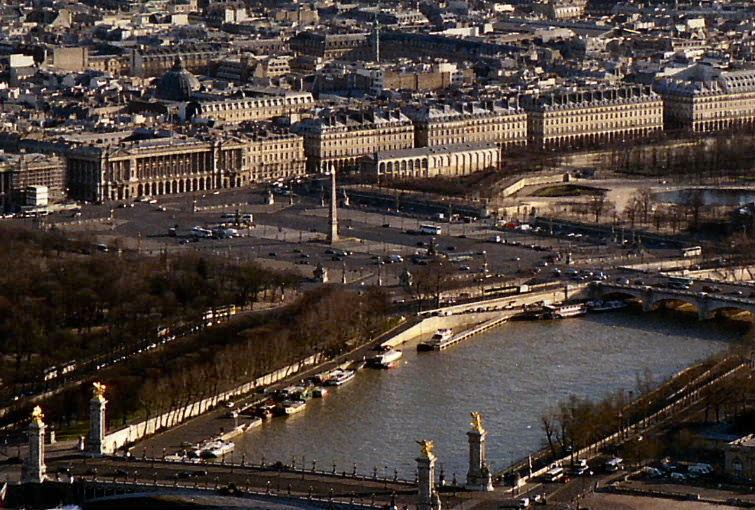 Place de la Concorde is in photo below with the Obelisque (looks like tiny Washington Monument) and the dark gray looking monolith a distance behind it is the Ritz Motel where Princess Di spent her last day. introduced me to her boyfriend (NO!!!) and father (looked like Mario Andretti). Maybe her boyfriend was an Ironman? She politely disappeared before I had a chance to get a photo taken. After five minutes of not finding anyone else, I decided to just pick a face that looked American. I asked a strange lady if she spoke English and with a Texas accent, she said, ”Yes I do”. Yeee Hawww!!! It was Barbara Wallace of Ft. Worth, Texas and her lovely husband, Homer. They took this picture of me, and I found out Barbara had lived in my hometown, Evansville, for three years as a child. Then she moved to Dale, Illinois. She was familiar with Shawnee Town, where my father’s relatives had lived.